A frame from “Whose Streets,” Dmovies. “Whose Streets?” is a film that originally hit theaters on August 11, 2017. Director, Sabaah Folayan, and co-director, Damon Davis, shed light on the 2014 killing of Mike Brown and its effect on the United States. Folayan is not only a filmmaker, but also an activist who is currently living in New York City. “Whose Streets?” was presented at the 2017 Sundance Film Festival, and Folayan was nominated for the Gotham Independent Film Award for Best Documentary. In a director’s note from the Whose Streets website, Folayan explained that Americans consume media every day; this form of media humanizes whiteness and highlights negative stereotypes of minorities. She puts emphasis on the fact that this film is not just a documentary of a distant occurrence. Most of today’s Americans lived through the murder of Mike Brown, and it is a story that needs to be told. She believes that as the news coverage dwindles, the truth rises above. The death of Mike Brown caused a monumental transition in United States’ citizens’ goals. “For this generation, the battle is not for civil rights, but for the right to live,” as stated on the film’s website. This striking statement reflects the fear that hit the nation after the news of the circumstances of Mike Brown’s death spread. August 9, 2014, was the day that African American teenager Michael Brown was shot by a white police officer, Darren Wilson, in Ferguson, Missouri. Brown was unarmed, and as a result of the shooting, protesters took to the streets to fight for and honor his memory. A few months later, on November 24, it was shared with the public that a grand jury voted against the indictment of Wilson. The protests in Ferguson continued to gain momentum after this announcement. “Whose Streets?” works to show the world what the media failed to represent. What made this documentary authentic and affective was the cast, who lived through Michael Brown’s death and the period of uproar that followed it. Among them was Tory Russell, who helped create Hands Up United, a social justice organization that formed after Mike Brown’s shooting. Another important person highlighted in this film was David Whitt, who worked for Copwatch, an activist group that works to protect society from police brutality by monitoring police activity. 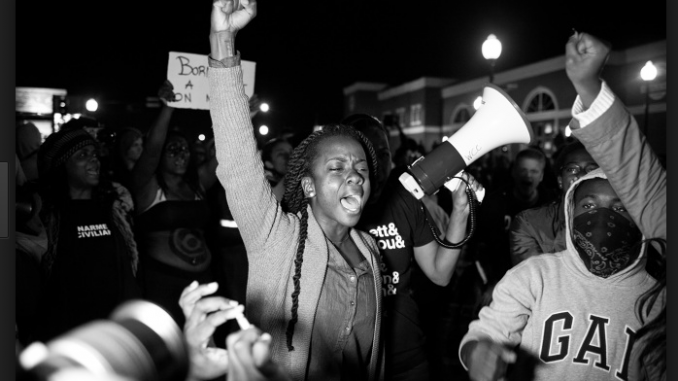 When watching the documentary, viewers witness the frontlines of the Ferguson protests. One of the most influential scenes takes place on a highway in which protesters are walking through the street chanting the question, “Whose streets?” In response to this, drivers are taking out their cell phones, sticking up their middle fingers, and even attempting to drive through protesters with their cars. This film captured a genuine glimpse into the lives and minds of the people of Ferguson as they faced racial injustice.